I always get excited whenever Toca Boca releases a brand new toy app. Today is no exception. Three months since their last app, Toca Builders, was released, finally we get to play and enjoy their latest creation: Toca Cars. As a kid, I have always enjoyed racing and bumping my toy cars. Now, Toca Cars offers a safe playground where juniors can drive their toy cars in high speed without having to worry about bumping and destroying things. When you start the app, you can choose your favorite driver: Viola Wheeler or her brother Walter Wheeler. Both of them are fearless drivers. They're not afraid to race in high speed, bump into things, and even jump high up in the air. Toca Cars offers two worlds where you can race your cars: a pre-populated world and an empty world. If you're playing for the first time, I'd suggest you start with the pre-populated world. In this world, the developers have already set up a fun track, complete with road signs, ramps, and jumps to test how fast you can drive. The pre-populated world also includes houses, big puddles of colorful ice creams, and mailboxes. Even though the world is limited in size, it's still big enough for juniors to have fun racing. Toca Cars also allows you to design your own world. Even though you can't modify the track design, you can still determine the look of your world by placing various items to your heart's content. The way you put these items can affect the way you drive your car. For example, you can put road signs in a particular pattern such that you can practice driving in zigzags. You can also put ramps and jumps in a sequence to let you jump as high as you can and even trigger your car to spread its wings and stay afloat for some time. To go into the editor mode, simply tap on the small house button on the top right corner. Then, swipe the objects on the bottom toolbar, drag the one you want, and position it on your playground. You can move, replace, or delete an object after you've placed it. However, it is to be noted that some objects can only have one copy, whereas other objects can have unlimited copies. If you need to rotate the orientation of an object, tap and hold the object with one finger, and use your other finger to rotate it. You can also pinch to zoom into or out of the world view. When you want to test your creation, tap on the car button on the top left corner. You can always go back to editor mode if you want to tweak your design. The app will automatically save your last design when you tap the Home button, so you can revisit or continue your design in the future. Toca Cars is a toy app, so juniors can play without adhering to any rules or any time limit. They can race as fast as they can without having to stay on track, and bump into anything. They can even tap on the restore button to restore the world into its previous state. When editing your world, keep in mind that your object will be positioned according to where its drop shadow is when you release your finger. This can be a bit confusing in the beginning, especially when you see that there are three points of references: your finger, the hovering object, and its drop shadow. If you pay attention to where the drop shadow is, you would be able to put the object exactly where you want it to be. Every object in Toca Cars are made from recycled cardboards. This means you can teach your kids about recycling, and invite them to design their own racing tracks from objects around the house. The fact that everything in this app is created and painted by hand can also inspire your juniors to paint their own cardboard creations. 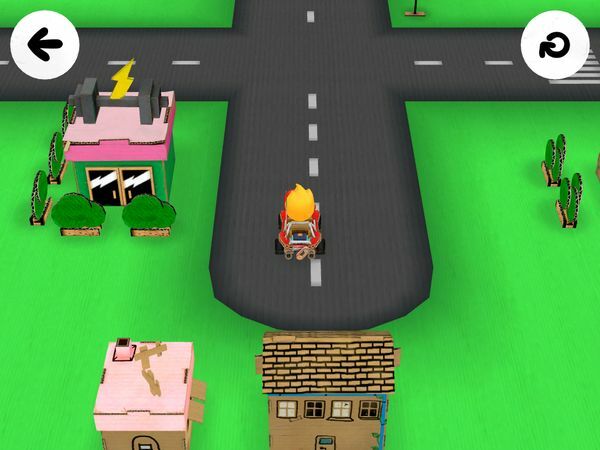 Toca Cars also includes three non-playable characters: a dog, a bird, and a robot. Each character has its own personality, making the app more interactive. For example, if you're somewhere near the dog, she will try to pursue you and knock your car down. On the other hands the blue bird is a bit shy. She will try to fly away if you drive near her. In Toca Cars, you can only have one custom world at anytime. If you want to create a major change in your world, it'd be better to just blow up your world and start from scratch. To do that, use the bomb button on the editor mode. Toca Cars is a fun toy app where it's all about racing. It's not about designing a perfect and beautiful world. It's not about having to stay on track or racing with other players. It emphasizes on simply having fun. And if it means reckless driving and bumping into things, then so be it. Get Toca Cars on the App Store.